Electrical networks, machines and equipments are often subjected to various types of faults while they are in operation. When a fault occurs, the characteristic values (such as impedance) of the machines may change from existing values to different values till the fault is cleared. There may be lot of probabilities of faults to appear in the power system network, including lighting, wind, tree falling on lines, apparatus failure, etc. A fault in an electric power system can be defined as , any abnormal condition of the system that involves the electrical failure of the equipment, such as , transformers, generators, busbars, etc. The fault inception also involves in insulation failures and conducting path failures which results short circuit and open circuit of conductors. Under normal or safe operating conditions, the electric equipments in a power system network operate at normal voltage and current ratings. Once the fault takes place in a circuit or device, voltage and current values deviates from their nominal ranges. The faults in power system causes over current, under voltage, unbalance of the phases, reversed power and high voltage surges. This results in the interruption of the normal operation of the network, failure of equipments, electrical fires, etc. Usually power system networks are protected with switchgear protection equipments such as circuit breakers and relays in order to limit the loss of service due to the electrical failures. Electrical faults in three-phase power system mainly classified into two types, namely open and short circuit faults. Further, these faults can be symmetrical or unsymmetrical faults. Let us discuss these faults in detail. These faults occur due to the failure of one or more conductors. 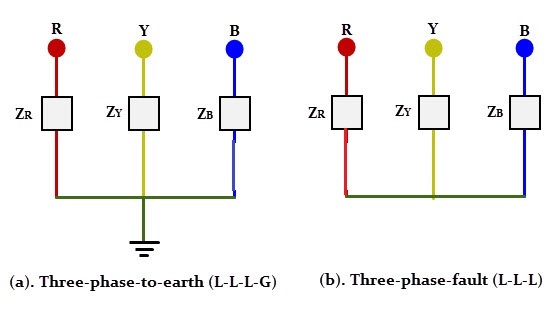 The figure below illustrates the open circuit faults for single, two and three phases (or conductors) open condition. The most common causes of these faults include joint failures of cables and overhead lines, and failure of one or more phase of circuit breaker and also due to melting of a fuse or conductor in one or more phases. Open circuit faults are also called as series faults. These are unsymmetrical or unbalanced type of faults except three phase open fault. Consider that a transmission line is working with a balanced load before the occurrence of open circuit fault. If one of the phase gets melted, the actual loading of the alternator is reduced and this cause to raise the acceleration of the alternator, thereby it runs at a speed slightly greater than synchronous speed. This over speed causes over voltages in other transmission lines. Thus, single and two phase open conditions can produce the unbalance of the power system voltages and currents that causes great damage to the equipments. Broken conductor and malfunctioning of circuit breaker in one or more phases. Exceeding the voltages beyond normal values in certain parts of the network, which further leads to insulation failures and developing of short circuit faults. Although open circuit faults can be tolerated for longer periods than short circuit faults, these must be removed as early as possible to reduce the greater damage. A short circuit can be defined as an abnormal connection of very low impedance between two points of different potential, whether made intentionally or accidentally. These are the most common and severe kind of faults, resulting in the flow of abnormal high currents through the equipment or transmission lines. If these faults are allowed to persist even for a short period, it leads to the extensive damage to the equipment. Short circuit faults are also called as shunt faults. These faults are caused due to the insulation failure between phase conductors or between earth and phase conductors or both. 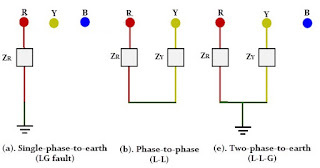 The various possible short circuit fault conditions include three phase to earth, three phase clear of earth, phase to phase, single phase to earth, two phase to earth and phase to phase plus single phase to earth as shown in figure. 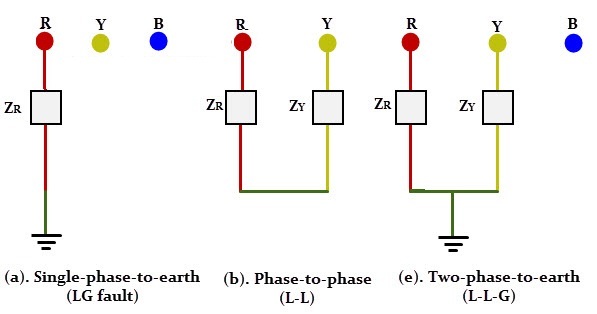 The three phase fault clear of earth and three phase fault to earth are balanced or symmetrical short circuit faults while other remaining faults are unsymmetrical faults. Internal effects include breakdown of transmission lines or equipment, aging of insulation, deterioration of insulation in generator, transformer and other electrical equipments, improper installations and inadequate design. External effects include overloading of equipments, insulation failure due to lighting surges and mechanical damage by public. Arcing faults can lead to fire and explosion in equipments such as transformers and circuit breakers. Abnormal currents cause the equipments to get overheated, which further leads to reduction of life span of their insulation. The operating voltages of the system can go below or above their acceptance values that creates harmful effect to the service rendered by the power system. The power flow is severely restricted or even completely blocked as long as the short circuit fault persists. As discussed above that faults are mainly classified into open and short circuit faults and again these can be symmetrical or unsymmetrical faults. A symmetrical fault gives rise to symmetrical fault currents that are displaced with 1200 each other. Symmetrical fault is also called as balanced fault. This fault occurs when all the three phases are simultaneously short circuited. These faults rarely occur in practice as compared with unsymmetrical faults. Two kinds of symmetrical faults include line to line to line (L-L-L) and line to line to line to ground (L-L-L-G) as shown in figure below. Symmetrical FaultsA rough occurrence of symmetrical faults is in the range of 2 to 5% of the total system faults. However, if these faults occur, they cause a very severe damage to the equipments even though the system remains in balanced condition. The analysis of these faults is required for selecting the rupturing capacity of the circuit breakers, choosing set-phase relays and other protective switchgear. These faults are analyzed on per phase basis using bus impedance matrix or Thevenins’s theorem. The most common faults that occur in the power system network are unsymmetrical faults. This kind of fault gives rise to unsymmetrical fault currents (having different magnitudes with unequal phase displacement). These faults are also called as unbalanced faults as it causes unbalanced currents in the system. Up to the above discussion, unsymmetrical faults include both open circuit faults (single and two phase open condition) and short circuit faults (excluding L-L-L-G and L-L-L). 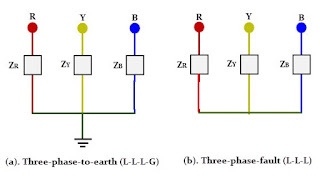 The figure below shows the three types of symmetrical faults occurred due to the short circuit conditions, namely phase or line to ground (L-G) fault, phase to phase (L-L) fault and double line to ground (L-L-G) fault. A single line-to-ground (LG) fault is one of the most common faults and experiences show that 70-80 percent of the faults that occur in power system are of this type. This forms a short circuit path between the line and ground. These are very less severe faults compared to other faults. A line to line fault occur when a live conductor get in contact with other live conductor. Heavy winds are the major cause for this fault during which swinging of overhead conductors may touch together. These are less severe faults and its occurrence range may be between 15-20%. In double line to ground faults, two lines come into the contact with each other as well as with ground. These are severe faults and the occurrence these faults is about 10% when compared with total system faults. Unsymmetrical faults are analyzed using methods of unsymmetrical components in order to determine the voltage and currents in all parts of the system. The analysis of these faults is more difficult compared to symmetrical faults. This analysis is necessary for determining the size of a circuit breaker for largest short circuit current. The greater current usually occurs for either L-G or L-L fault. When the fault occurs in any part of the system, it must be cleared in a very short period in order to avoid greater damage to equipments and personnel and also to avoid interruption of power to the customers. The fault clearing system uses various protection devices such as relays and circuit breakers to detect and clear the fault. Some of these fault clearing or faults limiting devices are given below. It opens the circuit whenever a fault exists in the system. It consists of a thin copper wire enclosed in a glass or a casing with two metallic contacts. The high fault current rises the temperature of the wire and hence it melts. A fuse necessitates the manual replacement of wire each time when it blows. 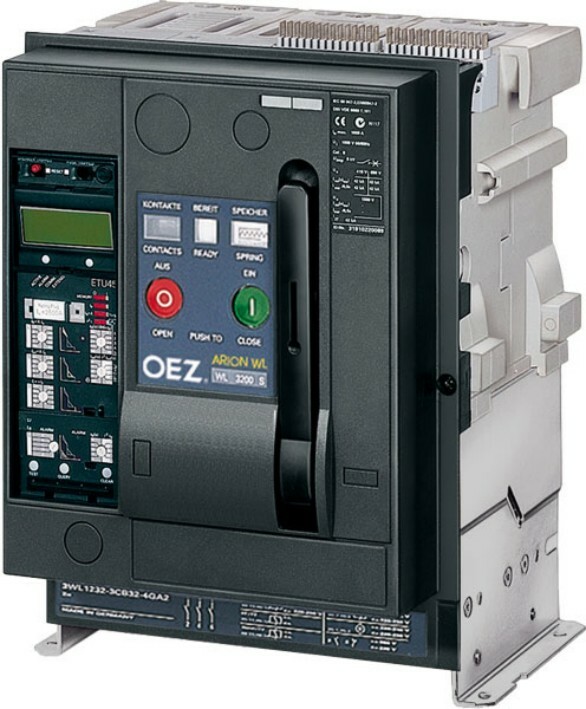 It is the most common protection device that can make or break the circuit either manually or through remote control under normal operating conditions. 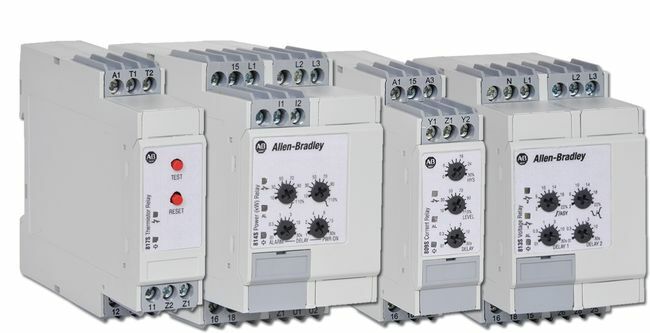 There are several types of circuit breakers available depending on the operating voltage, including air brake, oil, vacuum and SF6 circuit breakers. For more information on circuit breakers, follow the link attached. These are the fault detecting devices. These devices detect the fault and initiate the operation of the circuit breaker so as to isolate the faulty circuit. A relay consists of a magnetic coil and contacts (NC and NO). The fault current energizes the coil and this causes to produce the field, thereby the contacts get operated. Surges in the power system network caused when lightning strikes on transmission lines and equipments. This causes high voltage and currents in the system. These lighting faults are reduced by placing lighting arrestors at transmission equipments.